Premise: An actor - who starred in a quickly cancelled sci-fi TV show - tours the “con” circuit. 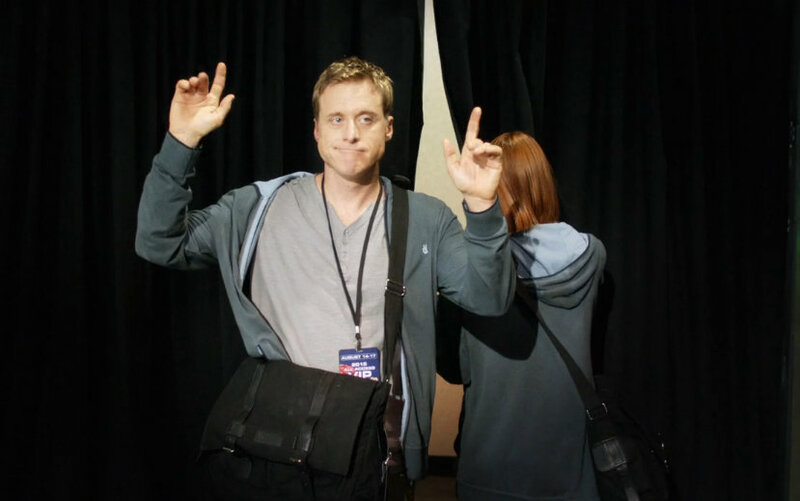 Alan Tudyk plays struggling actor Wrey Nerely, famous for having played starship pilot Cash [Cash/Wash get it?] on a fictional TV show called “Spectrum”. Fellow actor Jack Moore (Nathan Fillion) played the Captain of the ship. Spectrum was cancelled after only 14 episodes but then became a cult-hit in sci-fi circles. If none of this sounds familiar… then Con man is not for you [And… you probably don’t own a TV nor have access to the internet]. If, on the other hand, you recognize the obvious Firefly references, then you will probably enjoy this fun online web-series. Basically, Con man is a satire [with hints of an homage] of life after Firefly. However, the joke embedded in the premise can only take a show so far. This is not simply a sketch comedy, we are talking about 13 episodes and over two hours of content. You need a story and compelling characters for that. And I think Con Man delivers. As far as quality of the production, I have to say I was impressed. I was expecting a very low budget, indie look, but Con Man looked like a proper single cam comedy. They didn’t have the most impressive spaceship… but they had one, which is more than enough for a crowdfunded show [Let’s not get too demanding]. In addition, I love Alan Tudyk in comedies [even more than dramas]. I think he is genuinely funny. If you don’t believe me just go check out Suburgatory. Con Man also has an impressive list of guests from the sci-fi world including Firefly alums like: Summer Glau, Gina Torres, Sean Maher, Nathan Fillion, Jewel Staite [but not Adam Baldwin]; and other sci-fi favorites like: Tricia Helfer, Michael Trucco, Sean Astin, Milo Ventimiglia, Amy Acker, Seth Green, Joss Whedon himself and Felicia Day [because you cannot have a respectable web series without her]. But it was not ALL about the million geek-friendly actors. Con Man is cleverly written. It has a LOT of silliness and a few moments that are too quirky for their own good, but it also has very funny dialogue and satire that – more often than not – serves as indirect commentary on serious subjects. I thought this show was hilarious, love Alan Tudyk, miss Firefly!